Christian “Chris” Roger Quigley, Sr.
Christian “Chris” Roger Quigley, Sr., age 75, of Mechanicsburg, passed away at Geisinger Holy Spirit with his family by his side on Thursday, July 19, 2018. Chris was born on Thursday, February 25, 1943 in Carlisle to the late Edwin William Quigley, Sr. and Beulah Jeanetta (Rhoads) Quigley. In addition to his parents, Chris is preceded in death by his brother, Edwin William Quigley, Jr.
Chris’s survivors include his wife of 19 years, Elizabeth “Liz” Ann (Fraker) Quigley; his five children: Christian Quigley, Jr. and his wife, Samsute, of Mechanicsburg, Angel Lynn Quigley and her fiancé, David Logan, of Harrisburg, Troy Quigley and his wife, Cyndy, of Harrisburg, Chad Quigley and his wife, Alicia, of Enola, and Tasha May and her husband, Steven, of Pooler, GA; his 14 grandchildren; his six great-grandchildren; his six sisters: Martha May, Betty Jane Williams, Bonnie Lou Smith, Tammy Ann Quigley-Hostler, Elizabeth Foster, and Gwyn Zook; several nieces and nephews; and his beloved K-9 companions: Lily and Peanut. Chris was a U.S. Army Veteran who served in Panama during his tour of duty. 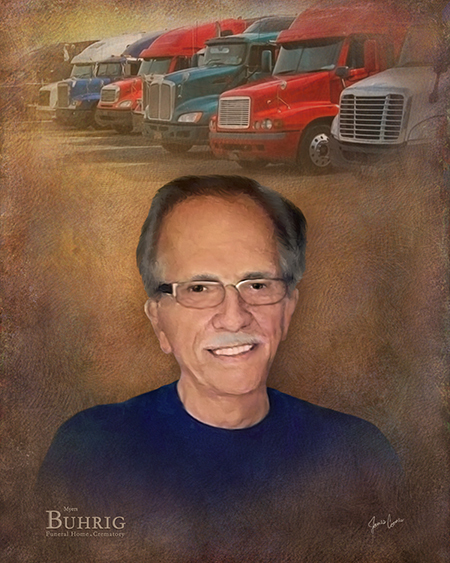 Upon discharge from the Army, Chris became a proud truck driver and spent his career hauling freight as a long-haul truck driver first for American Steel for several years, then for Carolina Freight for over 28 years and then as a short-haul driver for Giant for over 15 years. As Chris entered retirement, he promptly began driving as a porter for the Mercedes division of Sun Motor Cars for over five years. As his over 55 years of work history clearly shows, Chris had an unwavering work ethic. Chris attended Christian Life Assembly in Camp Hill for many years. Chris was an impeccable dresser who took pride in looking his best. His punctuality was a certainty. He loved life and enjoyed traveling, the beach, and all of his cars, especially his corvette. Chris loved to attend the sporting and school events of his grandchildren who he loved and adored. He will be deeply missed by his friends and family. All are welcome to join Chris’s family at his gathering of family and friends on Wednesday, August 1, 2018, from 2:00 p.m. until a time of remembrance beginning at 3:00 p.m. immediately followed by military honors which will be presented by the Cumberland County Honor Guard; all at Myers - Buhrig Funeral Home and Crematory, 37 East Main Street, Mechanicsburg, PA 17055. Chris’s family invites everyone to join them for a time of food and fellowship at Buhrig’s Gathering Place (next to Myers - Buhrig) immediately following military honors. Cremation was private. Contributions in celebration of Chris’s life can be made to any Veteran’s organization of the donor’s choosing. Chris’s family has entrusted his care to Myers – Buhrig Funeral Home and Crematory in Mechanicsburg, (717) 766-3421. Read Chris’s full obituary, view his memorial video and portrait, and sign his official guest book at Buhrig.com.